Select the best varieties of fruits always. Here the fruits should be as usual firm, fresh and ripe (not over ripe). Also ensure that there are no blemishes like big spots, sponginess, moulds/fungus etc. 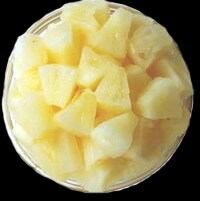 You can also use canned pineapple pieces but they will be costlier. The slices should be sweeter and the fruit should juicier besides having nice flavour. Also they should have pale golden yellow colour and not darker yellow. 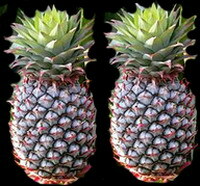 Cut the skin and also remove the stem from the centre by cutting the slices properly. Cook them after simmering the flame in water till they become tender and reduced to half the quantity. Add sugar and stir and boil to dissolve it. Add citric acid and colour. Cook until the consistency is obtained. Put off the flame and cool. Fill up the bottles, after sterilizing, leaving 1 inch head room below the lid for expansion. Close the lid tightly and refrigerate. If the jam is watery, then boil for another 20 minutes and if still watery after it is cooled, add some more sugar and pectin. Boil, cool and pack. If you use canned fruit, you can proceed directly. If not, you need to slice the fruit as mentioned above in the first recipe and then chop it. Take ¼ cup of sugar and mix the dry pectin and keep aside. Since sugar helps pectin forming gel, if you do not use sugar and feel the sweetness in the slices is sufficient, then while adding to the fruit slices, stir very vigorously to avoid the pectin from clumping. Stir the pectin mixed with the sugar into the chopped fruit. Transfer this to a big vessel with thick bottom. Set aside. In western countries, some people add a little cinnamon, ginger or clove or all the three to enhance the taste. But I do not suggest this. After 10 minutes, add the water and the remaining sugar and boil fully. Add also the lemon juice, colour and the preservative. Put off the flame and allow to cool. If the consistency is fine, then fill it up in sterilised bottles leaving 1 inch head room under the lid and closed with the lid tightly. Refrigerate. 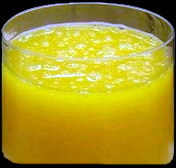 Remember that you need to add more pectin if the fruit is pineapple, orange etc., where the jam will be thinner. No-sugar pectin produces better jam with reduced sugar. If you need 10 tbs of regular pectin, for this type you need only 5 tbs. But without sugar, this will produce thin and bland jam as such we have to add sugar if we use this. Instead you can try low-sugar pectin and add sugar to get good jams if that does not produce the desired result. Note: It may take up to two weeks for the jam to set and thicken up. It will be runny until then! This entry was posted on March 17, 2012 at 8:31 pm and is filed under Jams, Morabbas, Squashes and Sauces with tags citric acid crystals, Jam, Jelly, Morabba, pectin, pineapple, potassium metabisulphite, sauce, sodium benzoate, squash, sugar. You can follow any responses to this entry through the RSS 2.0 feed. Both comments and pings are currently closed.